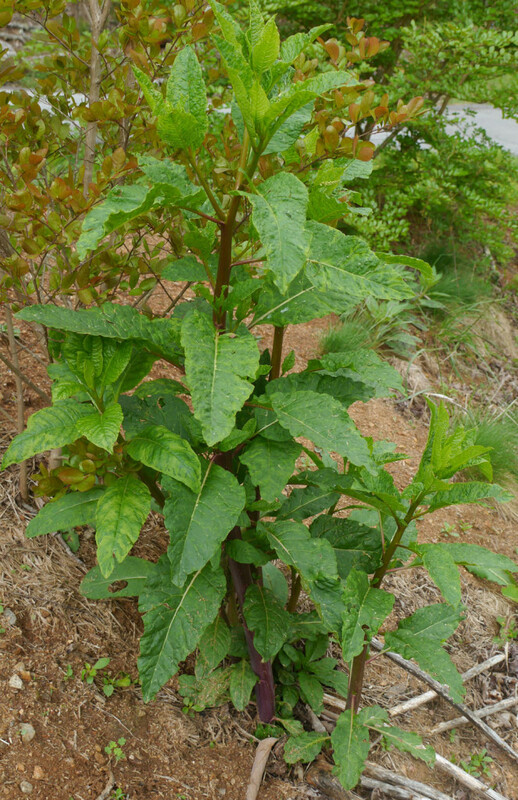 The very tall weedy plant called Pokeweed (Phytolacca americana) grows in waste places across most of North America. 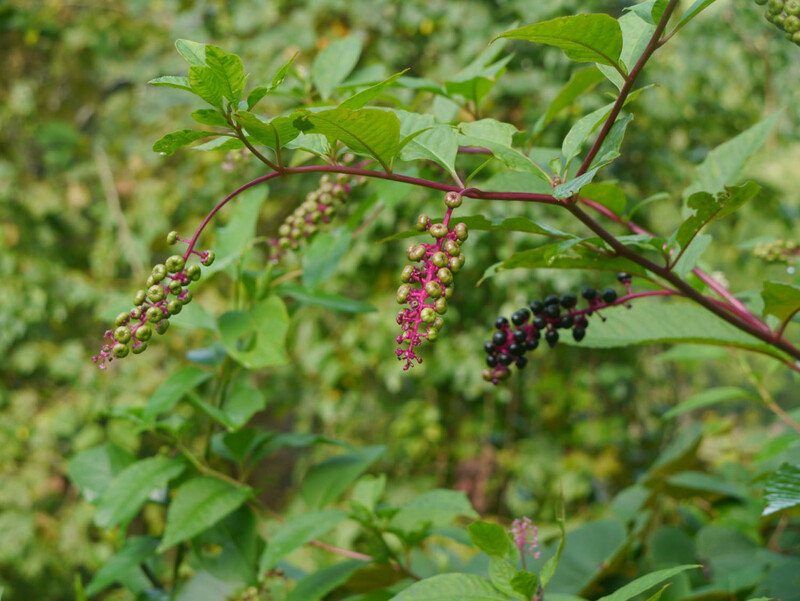 Pokeweed begins to bloom in early summer and continues putting out inflorescences all summer and into the fall season. 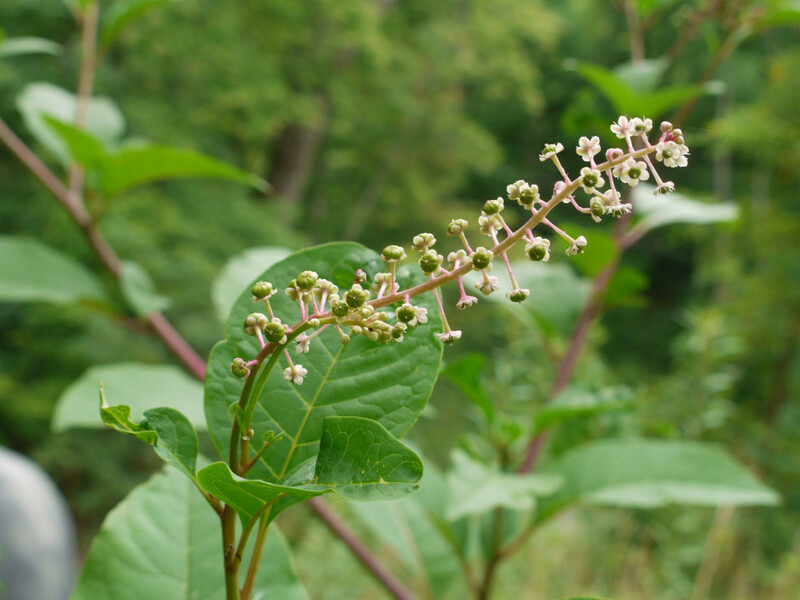 The flowers on the raceme bloom from the point closest to the plant’s stem to the tip of the inflorescence. The green ovary — after fertilization — looks like a green berry, which then develops into the dark purple berry. 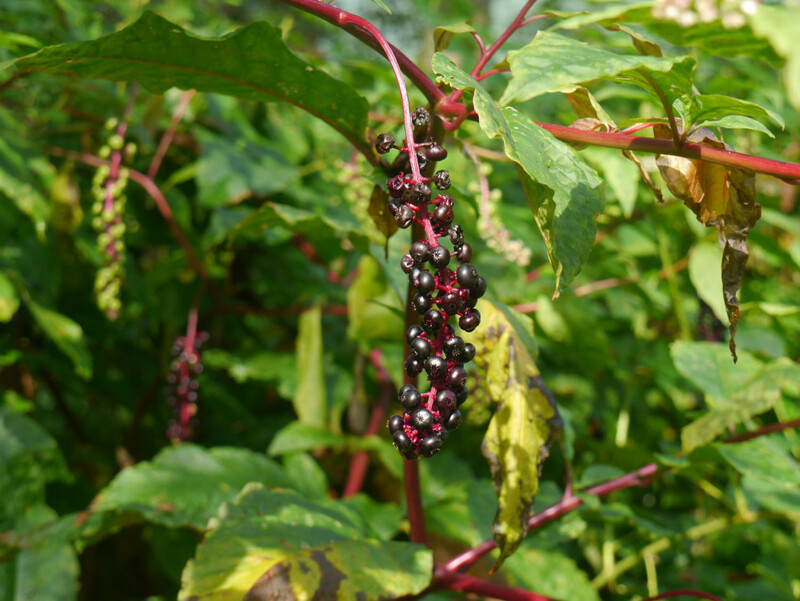 Gradually, the Pokeweed berries begin drying and shrinking. 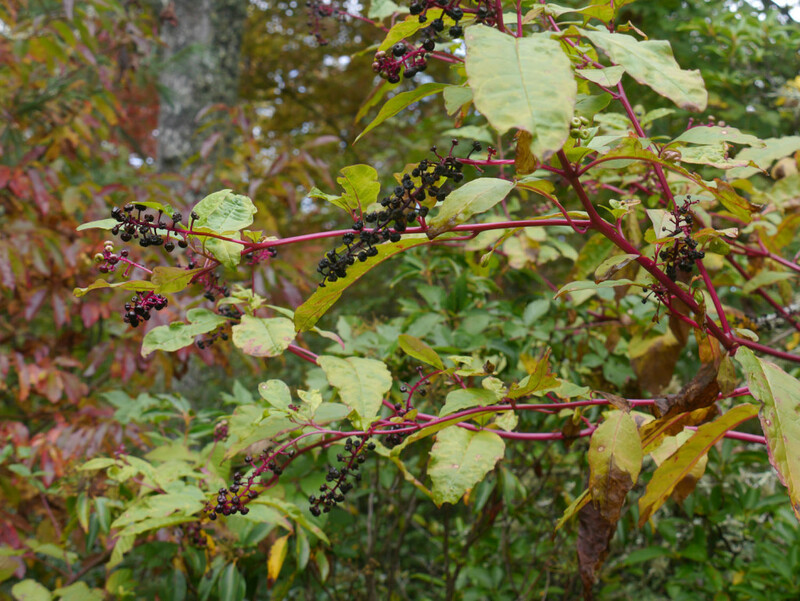 Pokeweed is especially colorful in the fall when it exhibits its multi-colored berries (green, red, purple and almost black), along with red stems, and yellow leaves. 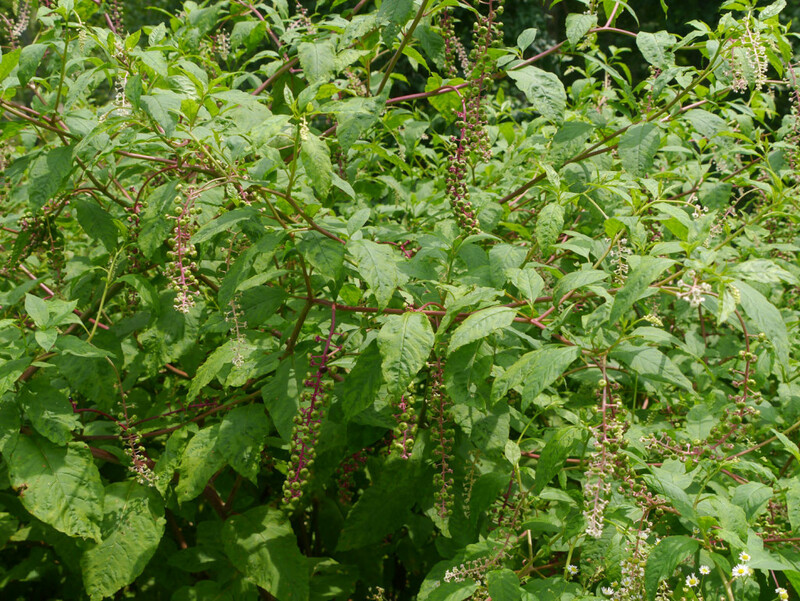 I’m having trouble telling the difference between pokeweed and amaranth when they’re young. Any sure ways I can distinguish between them? I don’t have any specific characteristics to tell you. What I suggest is that you keep studying each of these plants, in all phases of their annual cycles, until you can spot one at any of those phases and just “know” which one it is. 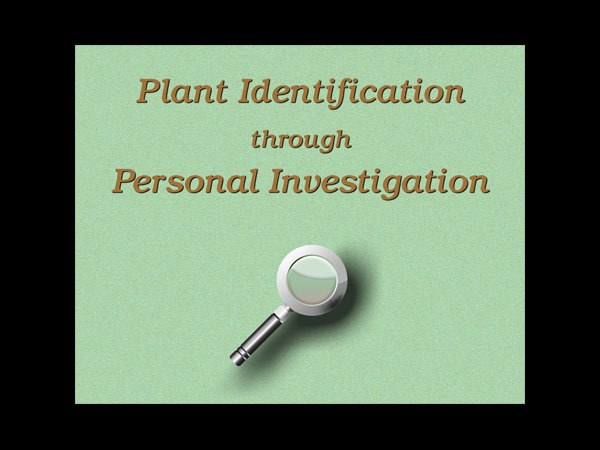 I have learned many plants that way and can now spot a “weed” in my vegetable garden when the plant has just sprouted. And I have the confidence to know that is what the plant is even when its characteristics are not yet obvious. Sometimes it is the leaf arrangement, sometimes it is the color (shade of green), sometimes it is the texture of the leaf. . .